Stone Canyon is located off of Wyoming Springs and Hwy. 620 in Round Rock. Featured builders included David Weekly and Newmark home builders.Stone Canyon is a well established community with large trees, sidewalks, and nearby schools. Major employers nearby include St. Davids Round Rock hospital, DELL Computers, IKEA, and Scott and White Round Rock. For workout enthusiasts and structured workouts and events, Creekbend Park at Brushy Creek and Brushy Creek Community Center nearby are great for this. Shoppers will be happy to know they are only a short drive away to the Round Rock Outlet Mall, IKEA, Lakeline Mall, The Domain at north Austin, and Wolf Ranch in Georgetown. Commuters have fairly short commutes into Austin, Georgetown, Round Rock, Pflugerville, Cedar Park, and Hutto. 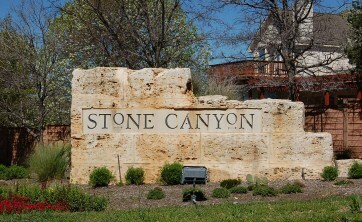 Homes for sale in Stone Canyon typically run from the $190's-$300K.